Tonight a rare waft of justice arose from the steamy swamps surrounding New Orleans and I feel compelled to return to Xavier Thoughts to notate the fact. Earlier today, in a court of law, four murderers and one lying dog were sentenced in the killing of innocent people and the maiming of four others struggling to survive in the aftermath of hurricane Katrina in New Orleans Louisiana. U.S. District Judge Kurt Engelhardt imposed the harshest sentence on Robert Faulcon, who was handed a 65 year term for his involvement in killing two of the victims. Kenneth Bowen and Robert Gisevius got 40 years for their roles in the murders, while Robert Villavaso was sentenced to 38 years. All were New Orleans police officers. Arthur Kaufman was sentenced to six years or his role in transforming the internal investigation into a police cover-up of the crimes. He, too, was a New Orleans police officer. In court, Lance Madison, the brother of slain Ronald Madison declared "You are the reason I can no longer trust law enforcement." Indeed. 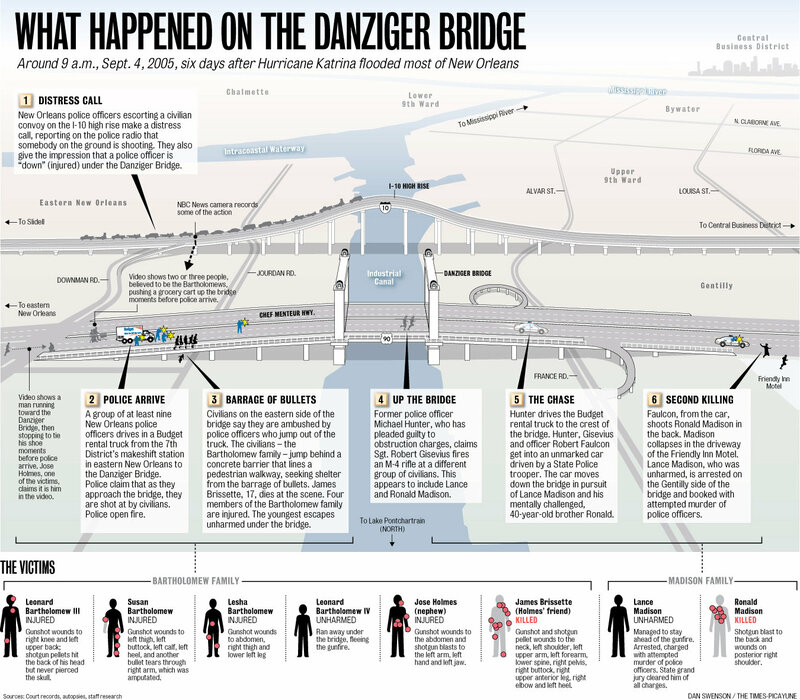 Since I first began blogging on the Danziger Bridge Massacre in 2005, two months after hurricane Katrina, I discussed the incident with many police officers who were both friends and acquantiences. To a man they all believed that the murderers involved would ultimately be vindicated. How is it that police officers can be so blinded by a badge that they cannot discern murder when it is under their very noses? It's disgusting. Shameful. Sad. This is the reason that no intelligent citizen can trust police officers in the United States any longer. They have removed themselves from society, mentally placed themselves in a special place with special privileges and they view citizens as either criminals or criminals in waiting. "There were many, many New Orleans police officers who performed courageous, selfless acts of heroism in the aftermath of Hurricane Katrina," Assistant U.S. Attorney General Thomas Perez stated. "But regrettably, the acts of heroism of so many have been overshadowed by the misconduct of a few. What we learned in this trial -- what we learned in these convictions -- is that the Constitution never takes a holiday. The Constitution applies every day of every week, and no police officer can take it upon himself or herself to suspend the Constitution." Those sentenced today were convicted last August on all charges, though a jury somehow found that their actions did not constitute murder. 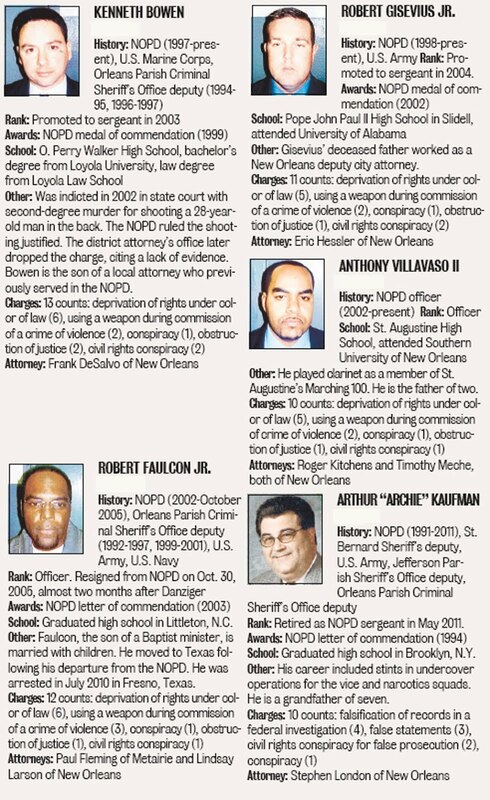 Their seven week trial included testimony from five other former NOPD officers who plead guilty and testified against their former brothers in blue. 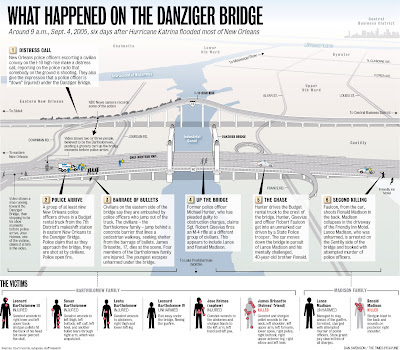 Thus far, prosecutors have secured eleven convictions in the Danziger Bridge Massacre, from ten NOPD officers to a St. Landry Parish man who impersonated a sheriff's deputy. 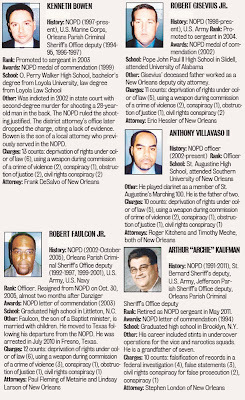 The Danziger Massacre was a focal point in a series of Justice Department investigations of post-Katrina police wrongdoing that has resulted in a total of fifteen convictions of NOPD officers. In 2010, three former New Orleans police officers were convicted in the case of Henry Glover, who was murdered and his body burned to conceal the fact. David Warren was convicted of shooting Glover in the back. He was sentenced to more than 25 years in prison in 2011; Gregory McRae, who was found guilty of burning the body, received a 17 plus year sentence. A federal judge has ordered a new trial for the third former police officer Travis McCabe, who was accused of obstructing the investigation. The Justice Department's Civil Rights Division launched an investigation into what it has called "patterns or practices" of misconduct by New Orleans police in the aftermath of hurricane Katrina, which killed nearly 1,500 people in Louisiana and more than 1,700 across the Gulf Coast. Robert Faulcon, Jr.: 6 counts of deprivation of rights under color of law, 3 counts of using a weapon during commission of a crime of violence, 1 count of conspiracy, 2 counts of obstruction of justice, and 1 count of civil rights conspiracy. 65 years imprisonment. Kenneth Bowen: 6 counts of deprivation of rights under color of law, 2 counts of using a weapon during commission of a crime of violence, 1 count of conspiracy, 2 counts of obstruction of justice, and 1 count of civil rights conspiracy. 40 years imprisonment. Robert Gisevius, Jr.: 5 counts of deprivation of rights under color of law, 2 counts of using a weapon during commission of a crime of violence, 1 count of conspiracy, 1 count of obstruction of justice, and 2 counts of civil rights conspiracy. 40 years imprisonment. Anthony Villavaso II: 5 counts of deprivation of rights under color of law, 2 counts of using a weapon during commission of a crime of violence, 1 count of conspiracy, 1 count of obstruction of justice, and 1 count of civil rights conspiracy. 38 years imprisonment. Arthur Kaufman: 4 counts of falsifying official records in a federal investigation, 3 counts of false statements, 2 counts of civil rights conspiracy for false persecution, and 1 count of conspiracy. 6 years imprisonment. I knew it was worth keeping your blog in my RSS feed and bookmarks. I hope this signals a return of your blogging, I think I speak for the entire gun blogging community when I say we've missed you. I've worried that perhaps you were prevented from blogging by terms of employment. I knew there was a reason that I did not remove your blogs rss feed. Good to have you briefly back. Was there any explanation as to why this was not murder? It's a crazy world we live in, X. Glad to see you back doing some writing. Really have enjoyed your blog and have it in my blogroll. Keep it up and hope to see more of your musings! Stay safe! You're a man after my own heart, gunwise and being street smart. When those hired to protect the population turn into criminals, that's about as close to an appropriate time for a lynching as it gets. Better to convict these stupid thugs in the courts, I'm appalled at the slow speed of justice, though. On a lighter note, thanks for resuming writing, Xavier, I've always enjoyed what you put out and still cruise your archives for wisdom and insight. I hope this isn't just a one-time return to the keyboard to wrap up something you were covering before coasting down. Thank you for returning. I know a former N.O. Officer who left N.O.P.D. over the corruption and everything else including this case. He was called to testify on this case, and I've been told he was informed to never return to N.O. P.S. : Glad to see your blog isn't totally cold...I've missed your writing. Xavier, when I first saw the news on this, I immediately thought of you. I know that you have almost stopped blogging but was hoping you would break your silence. I agree that the citizens of this country can no longer trust the police, individually or as a group. This is particularly painful for me because so many people in my family are and were police officers. An even larger tragedy is that we as a nation can no longer trust any level of government from the local township to the federal goverment to act according to the law or even tell us the truth. We need "runaway" grand juries to investigate corruption and lawless behavior on the part of government officials and legislators at all levels followed by indictments, arrests, trials and punishment. I too, when I saw this news, thought of you and how this was one of the first, if not the very first, topic you blogged on. And one of the latest (so far). I thought of another possible reason why all of the officers you spoke with felt these perps would be vindicated. It's possible they felt that since they themselves would never have committed such heinous crimes, that other officers sworn to uphold the law wouldn't either. Simplistic thinking perhaps. Unfortunately, though, I'm afraid the more obvious conclusion really is the correct one. I remember your comments when these scum buckets were first arrested. I am glad justice has been served. Glad to see you back, if even for a brief moment. I visit daily, hoping for something new. I knew you would have to write about this, the raison d'etre of this blog. If not a happy ending, then an end. Is this the end of the blog, too, or will you start writing again? LOL, a lot of us still stalking you! Nice to see a post. Just a simple "thank you" for your writing, and coverage on this, Xavier. Nice to read a post from you Xavier. Hope you come back to writing. Thanks for the update. Hope you are well. Justice lurches ahead. Painful. Glad for your respected perspective. All the best. Write a book will ya?! Thanks again for your prior efforts. You have provided us great information.I don't think so that it was murder. I am getting sad if this is the end of your blog series. Merry Christmas and a happy and prosperous New Year to you and your family in 2013! Just a thank you for continuing to maintain the blog. Sounds like they got what they deserved. Hopefully, this should convey the message that noone is above the law.